" We were in total disbelief when doctors told us that our baby has a heart defect during the 5th-month pregnancy scan. We didn’t know where to go for help. The local doctors assured that it'll heal by itself. But we always had the fear and anxiety. We took a lot of care and prayed every minute for the health of our baby. But fate was cruel, my baby was born suffocating, he turned blue completely within a few hours of his birth. I was devastated when doctors said that my baby cannot survive without urgent surgery." 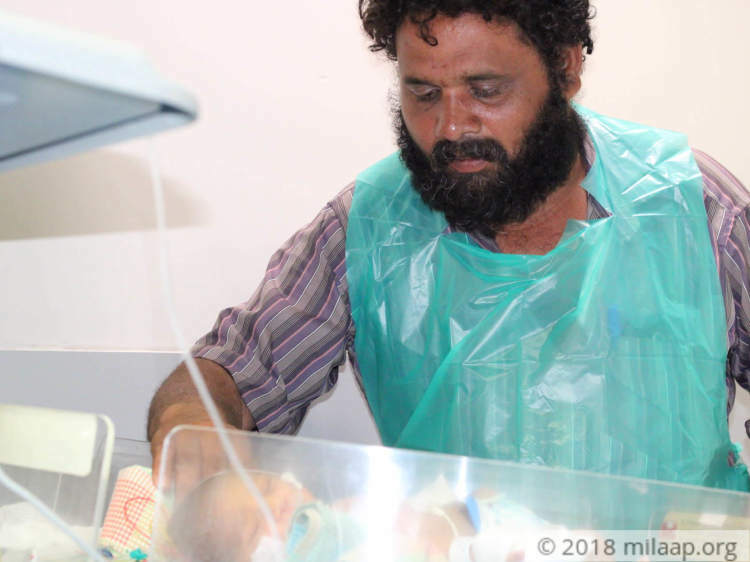 - Senthamarai, Father of an 8-days-old baby. Kavitha was thrilled when she got pregnant. 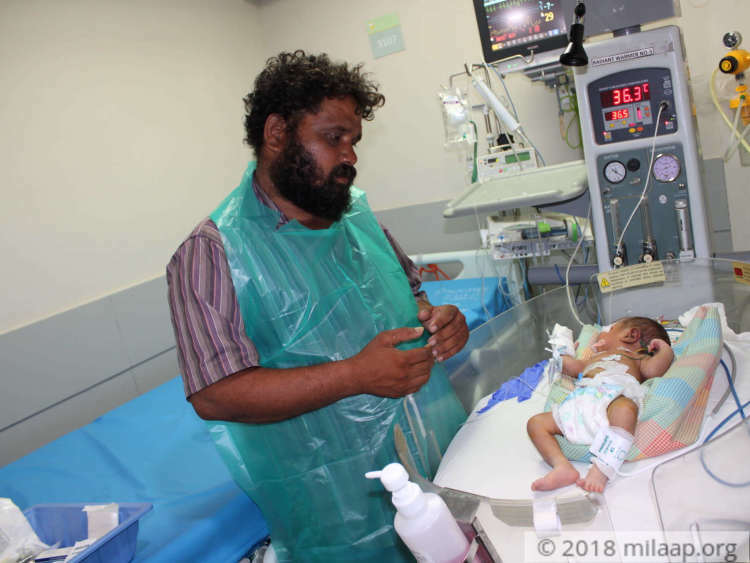 She and her husband Senthamarai waited for 3 long years and they had a lot of plans for their baby. Despite their poverty, they were determined to give the best to their baby and saved every rupee for his future. As doctors said they believed that heart defect will go by itself but to their shock, their baby was born with multiple heart defects. "We are not educated, we didn't understand the complications but we believed that our baby will be healthy. My wife had a C-section, even before she could gain her consciousness my baby was taken to a different hospital as his condition was critical. I felt totally lost. He was on ventilator support. I did not understand any of his heart problems, but when the doctor said he needs an immediate surgery, I knew his life is at risk. The very thought of losing our precious child even before we could hold him in our arms was breaking me into pieces." - Senthamarai, Father. 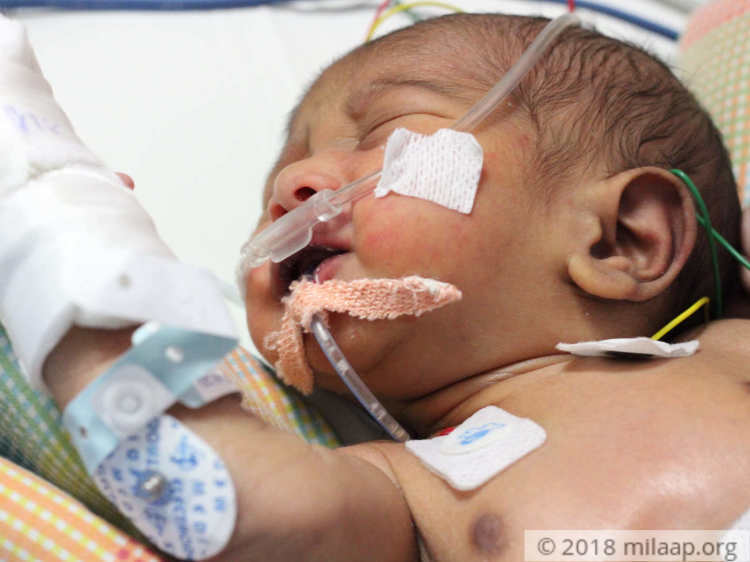 Baby of Kavitha has multiple heart defects that can be cured only by surgeries. His aorta is connected to the right ventricle and the pulmonary artery is connected to the left ventricle which is just the opposite of the normal heart's anatomy. 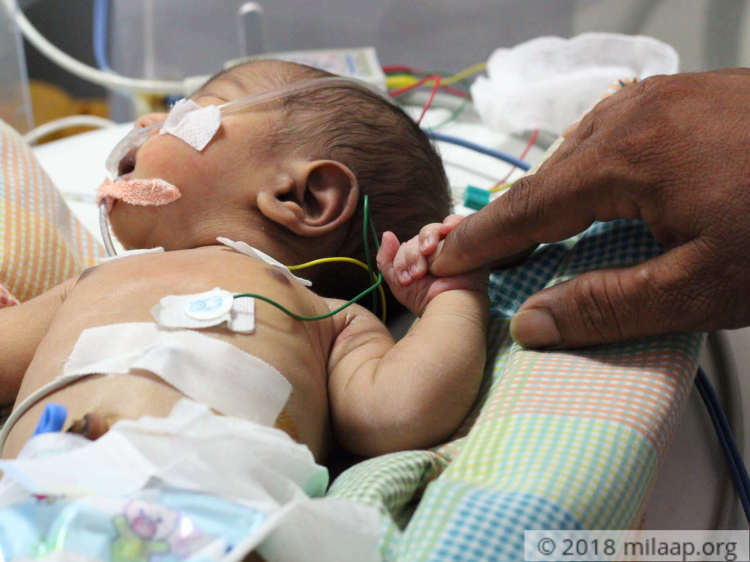 This baby also has a hole in the heart that didn't close the way it should after the birth because of which the blood may skip the necessary step of circulation. My baby had a surgery within 3 days of his birth. I still don't understand how his little body could bear so much pain. I was relieved when the surgery was over and when doctors said that his condition is stabilizing. But they also said it is not enough and baby needs another surgery to survive. My wife and I are waiting for every moment desperately to hold him in our hands and take him back home. My wife has not recovered yet and she cries uncontrollably. I'm watching them suffer helplessly." Senthamarai. Senthamarai sells flowers in the market and he earns around Rs 4000 per month. He and his wife have both lost their parents and they have no one to support in their family. 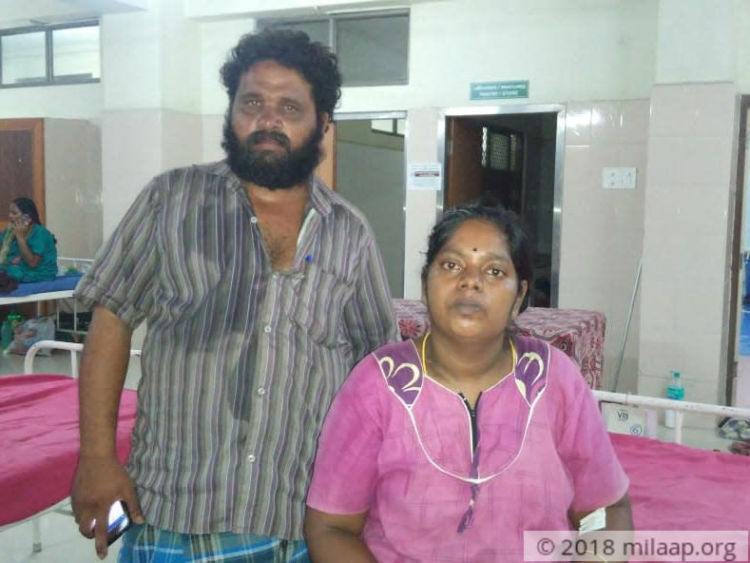 Senthamarai has exhausted the government medical insurance for the first surgery and now he has nothing left with him. He was not able to go for work ever since the baby was born. He is physically and mentally exhausted. "I'm borrowing money to even buy medicines. I skip my meals that's the only possible way I can save some money but I make sure my wife eats every meal because she needs strength. Doctors said that my baby can also grow normally and we can take him home after the surgery. But I cannot afford it. I don't even know whom to ask for help. Who will give such a huge money to a flower seller? I dread at the thought of going back home without my baby. We will have no reason to live without our baby." - Senthamarai. 8-day-old baby of Kavitha is battling for his life due to multiple heart defects. He had a surgery when he was just 3 days old now he needs another surgery to survive and recover completely. His poor parents are desperately trying to save their only baby. The surgery costs Rs 5 lakh and it is beyond their means. Only your support can save their only baby from this dreadful disease. Your kind contribution can save this newborn baby's life and help him to live a normal life. We have some exciting news to share. 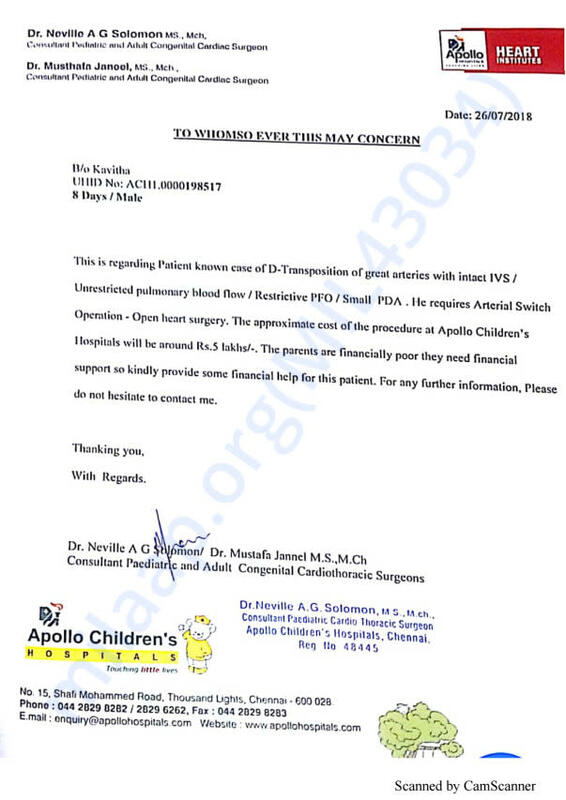 As we have updated in the previous update , baby of Kavitha underwent the Arterial Switch surgery and got discharged. She is recovering well. Most of the funds have been utilized for her treatment and the remaining funds will be utilised for the surgery of another needy kid. 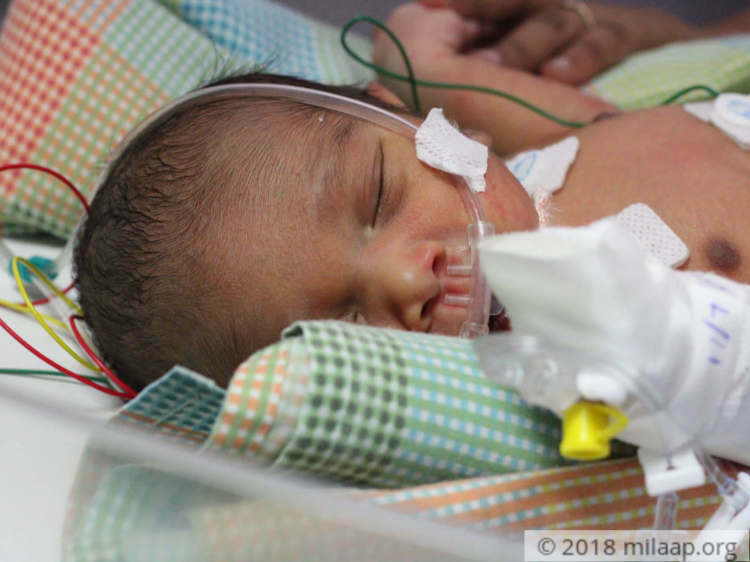 https://milaap.org/fundraisers/support-baby-of-senthil. The family would like to thank all the supporters who has contributed to the cause from the bottom of their heart. Kid could not have survived without your support. Once again the family would like to thank for all the wonderful support, prayers and blessings from each and every one of you. 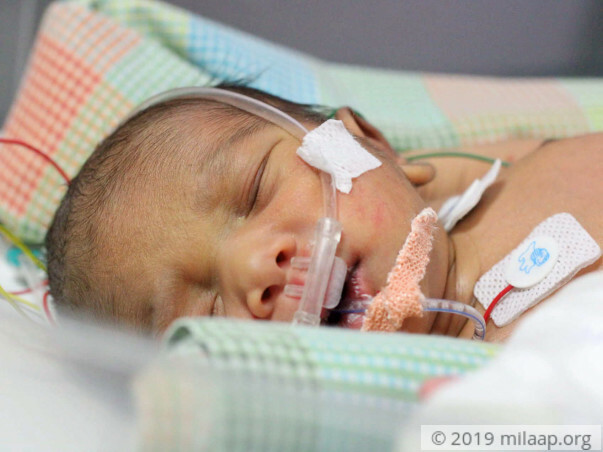 We would like to inform you that Baby of Kavitha have made good progress after the surgery and is ready for discharge in a week. We could not have done this without your support. The baby is currently doing okay and is likely to undergo the surgery this week once the doctors run a few tests. They are observing the baby closely to be able to provide the best of medical care possible. We shall keep you posted on further developments. Thank you so much everyone!